This short sleeve pro shirt is a contemporary fit jersey featuring the 'Loop 21' neck design. It is a cut & sew construction with sublimated panels and contrast taping detail. 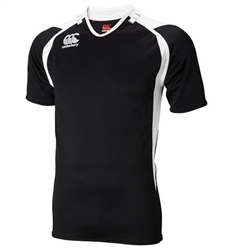 The Jersey is finished with the Canterbury logo embroidered on the right chest. Need 12 or more? Contact us for special pricing. Decoration and numbering also available.